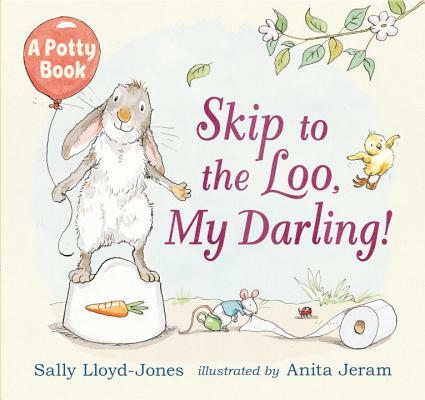 Sally Lloyd-Jones's riotous narration and Anita Jeram's endearing illustrations make this a charming and energetic invitation to potty trainees everywhere. Bunny wants his potty. What will Bunny do? Only one thing for it . . . skip to the loo! Bunny's not the only one skipping to the loo. Look who else wants their potty! Quite a few. . . .
With rollicking rhythm, Sally Lloyd-Jones gets the party going in a book that simply rejoices in the call of nature. Everyone is invited to celebrate—from a lonely dodo to a wibbly woo, from Lord and Lady Huff Puff to an elephant in a tutu. But when the party is in full swing and everyone's on their potty, Bunny sees that someone very important is missing. Who could it be? Sally Lloyd-Jones is the author of the picture book How to Be a Baby, illustrated by Sue Heap, and its sequel, How to Get Married. She lives in New York. Anita Jeram is the illustrator of Guess How Much I Love You, the Guess How Much I Love You storybooks, and You’re All My Favorites, all written by Sam McBratney. She has also illustrated several books by Amy Hest: Little Chick and a series about Sam and Mrs. Bear. Anita Jeram lives in Northern Ireland. Jeram’s characteristically delicate ink-and-watercolor artwork adds gentle humor throughout...Leaving the mechanics of using the potty to concerned adults, Lloyd-Jones’s singsong rhymes instead establish an “everyone’s doing it” aura of excitement as a means of encouragement. Sally Lloyd-Jones's celebratory book follows a group of silly creatures, including an elephant in a tutu, a monster, and an adorable bunny, as they look forward to a fun bathroom session. Illustrations by Anita Jeram—who did the artwork for Guess How Much I Love You—give the book a timeless feel. Young children...will most likely giggle and relate to the general silliness that ensues. Jeram brings her soft ink and watercolor illustrations to life here. Bunny is awash in softly hued grays and pinks, while a charming elephant in a tutu and ballet toe shoes delicately parades through toward the final pages of a multitude of animals perching on their potties in the outdoors.